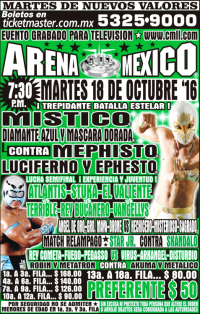 Metalico replaced Bandido. Rudos took 1/3. Vaquerita replaced Estrellita. Rudas took 2/3. Tecnicos took 2/3. 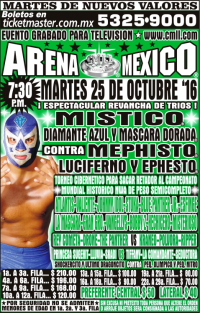 Niebla caused the DQ, still wants a title shot against Maximo. Maximo accepted. 8th defense. UG took 2/3 to beat Valiente yet again. Money thrown in. Tecnicos took 2/3. Shocker fouled Marco. Event Notes: Edecan Ximena Buendiadebuted on this show. straight falls. 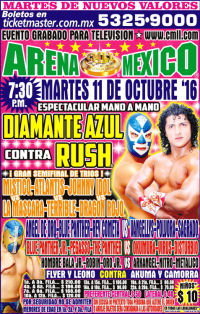 Rush convined Tirantes to call Diamante Azul for a non-existent foul. Azul demanded a singles match next week. Tecnicos took 1/3. Looked like the DQ was to get out of the match after a Nitro injury. 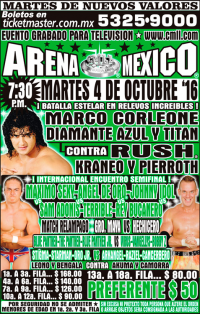 Volador took 2/3 in an outstanding match. Volador's 11th defense. La Mascara (in a Sombra) appeared to distract the referee, allowing Rush to sneak in a foul on UG. Mistico & Dragon Lee weren't happy with Rush & La Mascara. Robin replaced Flyer. First match for the rudos in six months. Tecnicas took 1/3. Jarochita replaced Estrellita on Wednesday (and maybe is a tecnica now?). She beat Seductora with a escalera. Tecnicos took 1/3. Panther's reached 38 years of wrestling. Pequeno Violencia replaced Pierrothito. Tecnicos took 1/3. Tecnicos took 2/3. Marco Corleone avoided a Shocker foul and pinned him. 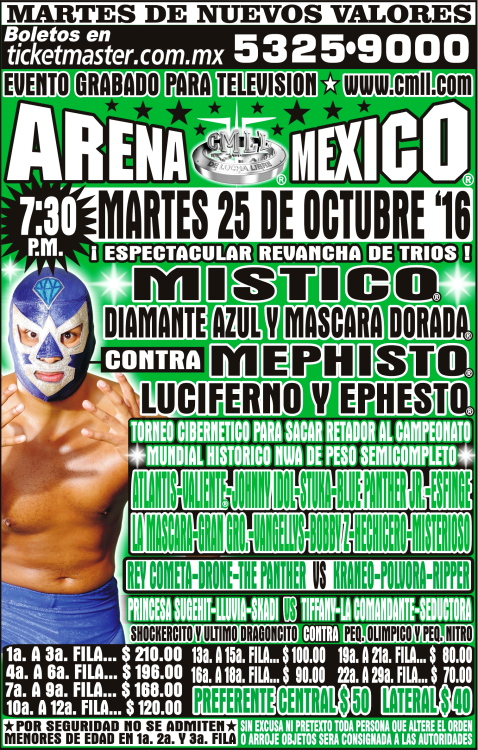 Titan replaced Rey Cometa (because Cometa was added to Friday's show) Tecnicos took 1/3. Rush took 1/3. La Mascara distracted Tirantes, Rush stole Diamante Azul's mask, fouled him, put on the mask, and covered him for three. It was impossible for Tirantes to not see Rush had the mask on, and he even stopped counting after one, but then continued counting. Diamante Azul pulled the mask off of Rush's face and put it back on. 11:45. Tecnicos took 1/2, the last when Mascara fouled Marco. 2:49. 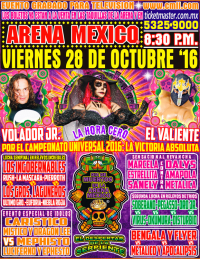 Rey Cometa replaced Cavernario (not a champion!) on Monday. 10:17. Valiente pulled off the giant upset (despite the crowd cheering UG) and advanced to the 10/28 final. Fantasy replaced Astral on Monday. Rudos took 1/3. Flyer replaced Fuego (moved up) on Tuesday. Robin replaced Leono, Hijo del Signo replaced Virus. Rudos took 1/3. Fuego replaced Esfinge on Tuesday. Rudos took 1/3. 2) El Cuatrero, Sansón, Skándalo b Oro Jr., Soberano Jr., Star Jr.
Oro Jr. replaced Starman (who's been missing for a couple weeks now.) Straight falls for tecnicos, Skandalo unmasking Soberano. 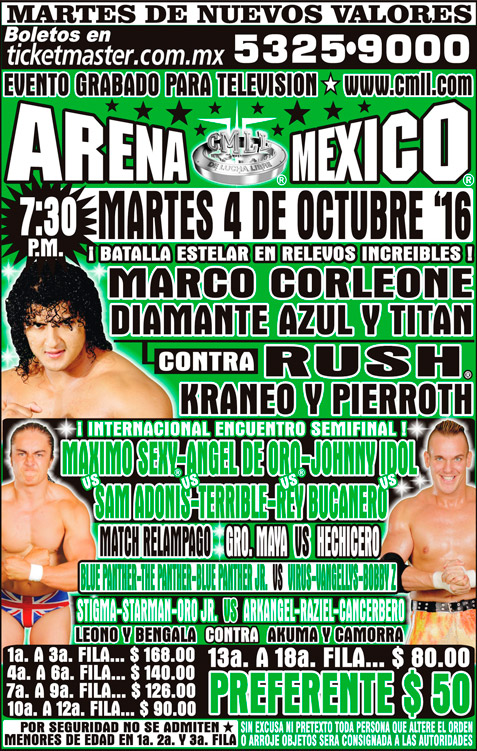 Johnny Idol replaced Diamante Azul on Monday. Tecnicos took 1/3. 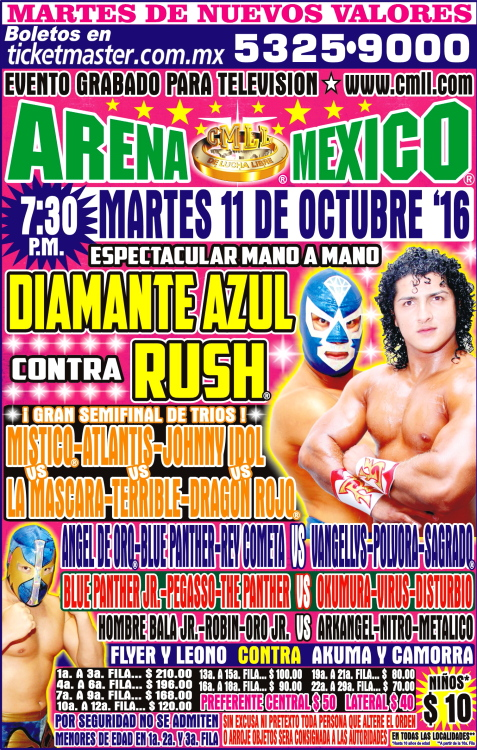 Diamante Azul replaced Angel de Oro (ROH) on Monday. Tecnicos took 2/3. Okumura replaced Arkangel. Tecnicos took 1/3. Skandalo Driver for the win. 13:30. Tecnicos took 1/3, the last when Dalys accidentally dropkicked the referee for the DQ. She and Marcela fought post match. 9:39. Rudos took 1/2. Rudos took 1/2. Rush and his partners did not get along at all. Team Rush took 1/3, the last via foul. They set up a singles match next week. Guerrero Maya Jr. replaced Rey Cometa. Rudos took 2/3. 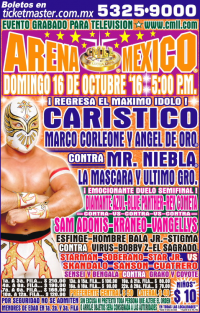 No battle royal, tecnicos vs rudos. 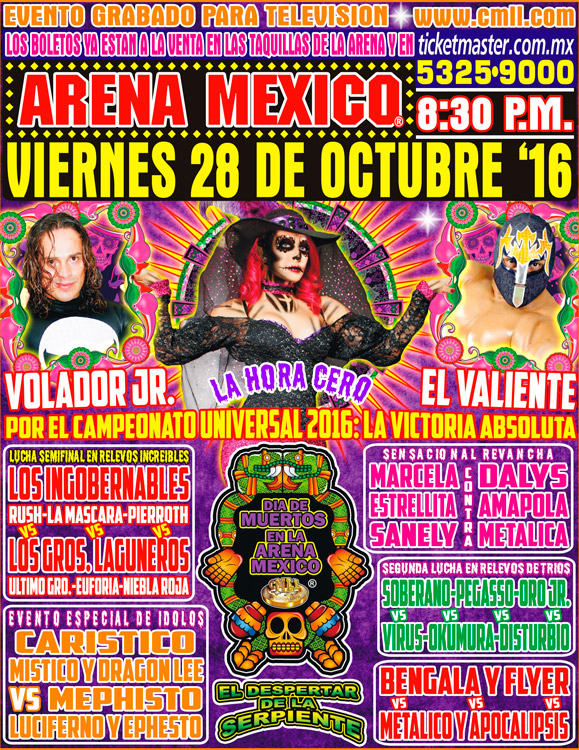 Eliminations: Esfinge (Bobby Z), Vangellys (Valiente), Blue Panther (Gran Guerrero), Bobby Z (Atlantis), Gran Guerrero (Valiente), Stuka (La Mascara), La Mascara (Atlantis), Atlantis (Hechicero) and Valiente (Hechicero, hooking the ropes with his legs for leverage), leaving Hechicero as the (a bit surprise) winner. 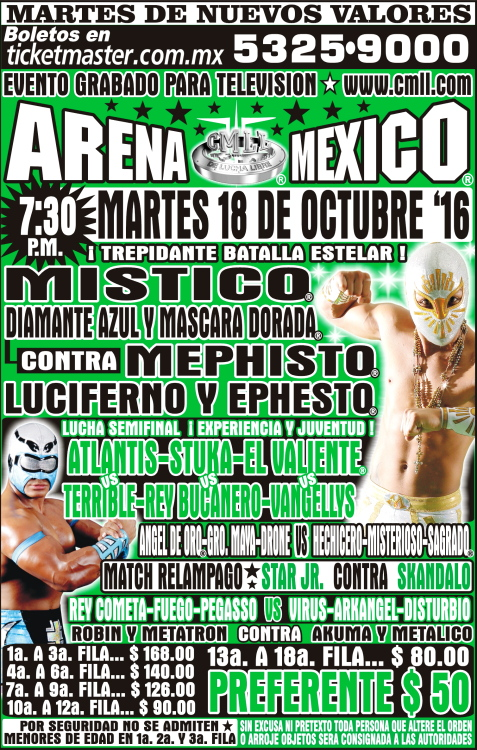 Hechicero faces Rey Bucanero next week. straight falls, with Marcela being KOed after an illegal choke to cause the DQ. Marcela was stretchered out (though it seemed like a worked injury) and gets a title shot out of this. 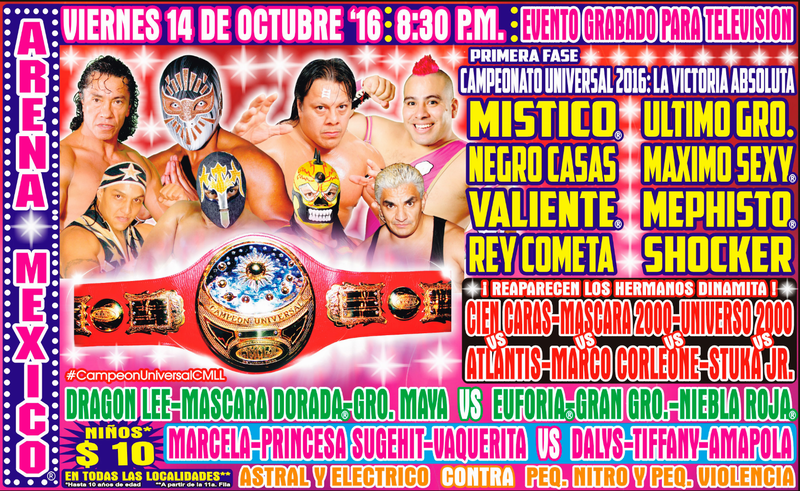 Dalys was the evil god thru the night (along with Valiente and Volador.) Starting with this match, the losers were all taken to hell. Rush snuck in a foul on UG. Seconds were Soberano and Mephisto (Valiente, also back from Hell rather quick.) Valiente took falls 1/3, the last with two Valiente Busters to win. 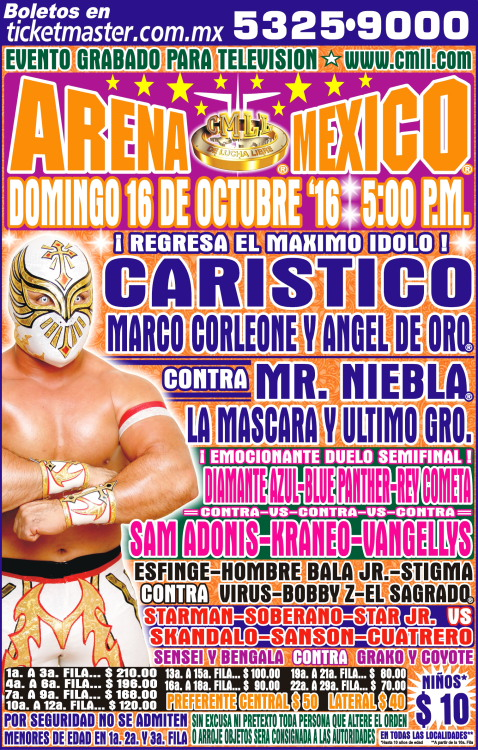 4) Kráneo, Ripper, Sam Adonis b Blue Panther, Drone, Guerrero Maya Jr.
Rudas took 2/3. Losers were dragged to hell starting with this match. UG took falls 2/3 to win again.